Are you one of those people who have a red notifications icon reminding you to update apps on your mobile device? Are you like me, and you turn off automatic updating – because you travel a lot and don’t want updates chewing through your mobile data allowance, or your free WiFi voucher at a motel for example? 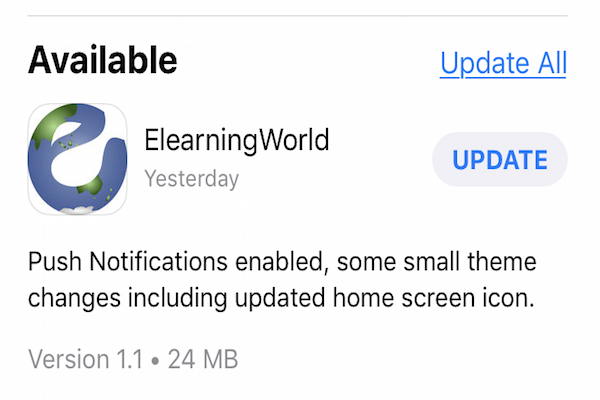 But don’t forget to check your ElearningWorld App and keep it up-to-date now and again. The App is actually quite small (around 25Mb), and we do refine the app every few months, to give you a better experience and new features. You can install our free ElearningWorld App from the Google Play Store.